This is one of the best Cyber Monday camera deals we've seen so far for an accessory... the manufacture has lopped whopping £200 off the priceof its twin-handled motorised A2000 gimbal. These motorised devices provide super-smooth support for handheld video shooting – and usually cost around £500 plus if you want one big enough to support your DSLR or your mirrorless system camera. The FeiyuTech A2000 allows you to support a camera with an all-up of weight of 2kg, so is more than capable of working with a camera set-up such as a Canon EOS 5D Mk IV with a standard lens, or a Sony A7 with a standard zoom. It gives three-axis image stabilization from its built-in motors. A joystick control gives you complete control over camera movements without having to touch the camera itself – allowing you to track and follow your subject as your record their movement. The rechargeable battery gives up to ten hours of continuous shooting. 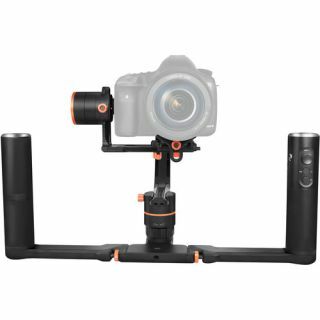 This gimbal is also on offer in the UK, with £200 off its usual price - with the deal running still running at Jessop (it has ended at some retailers). FeiyuTech is offering is professional A2000 motorised gimbal for DSLRs and CSCs for just £299 over Black Friday and Cyber Monday – saving an incredible £200 off the usual price for this high-end videomaking accessory .